Resources to assist states reimagine their public reporting tool to reflect state priorities, highlight the breadth of school data and most importantly, be parent-friendly. States should reinvent their school report cards as a 21st-century, easy-to-use tool for empowering parents and students. ExcelinEd offers extensive resources to assist states reimagine their public reporting tool to reflect state priorities, highlight the breadth of school data and most importantly, be parent-friendly. In recognition of the limitations of current state public school accountability reports, ExcelinEd sponsored the My School Information Design Challenge in December 2014 to reimagine the public reporting of school accountability data. Following that competition, ExcelinEd brought the design challenge to life with the winners, Collaborative Communications and Social Driver, as well as community data partner Jacksonville Public Education Fund. ExcelinEd and these partners developed and launched Know Your Florida School, an exemplar online school report card tool featuring data from the state of Florida. Know Your Florida School’s engaging, mobile-friendly interface put information about local schools—from student performance to the details of Florida’s school grades—into context to help parents access and use the data. Though the prototype site is now archived, extensive resources – including the open-source code – remains available. The framework and resources are designed to provide states with everything they need to reimagine their own public reporting tool. The following resources outline lessons learned and best practices for creating online school report card tools. Each case study focuses on a different topic area, and includes an action checklist on the last page. 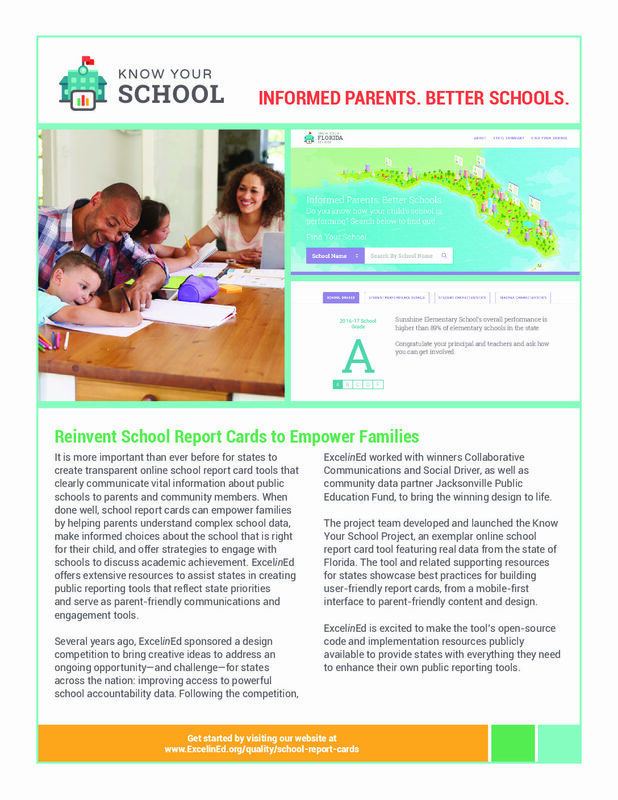 Reimagining School Report Cards case study lays the groundwork for enhanced data transparency and school accountability. 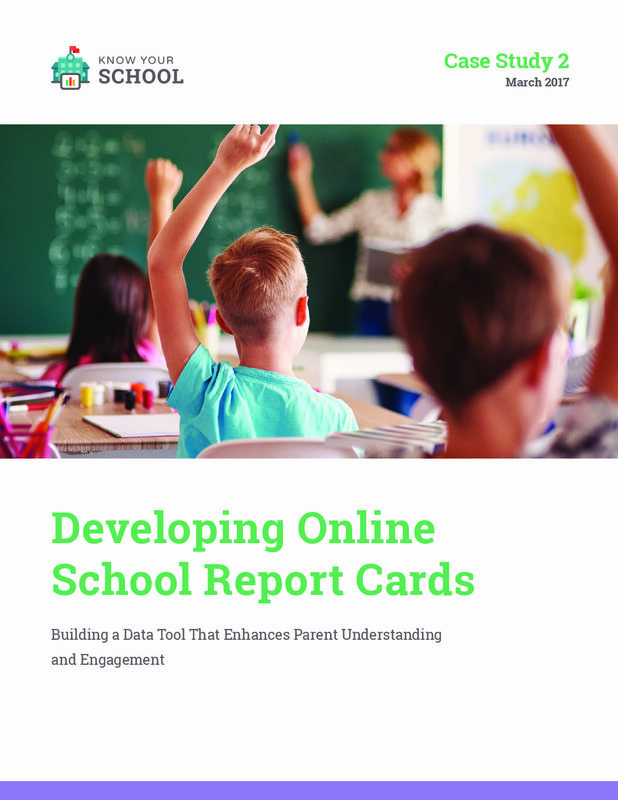 Developing Online School Report Cards provides comprehensive guidance for building a data tool that enhances parent understanding and engagement. 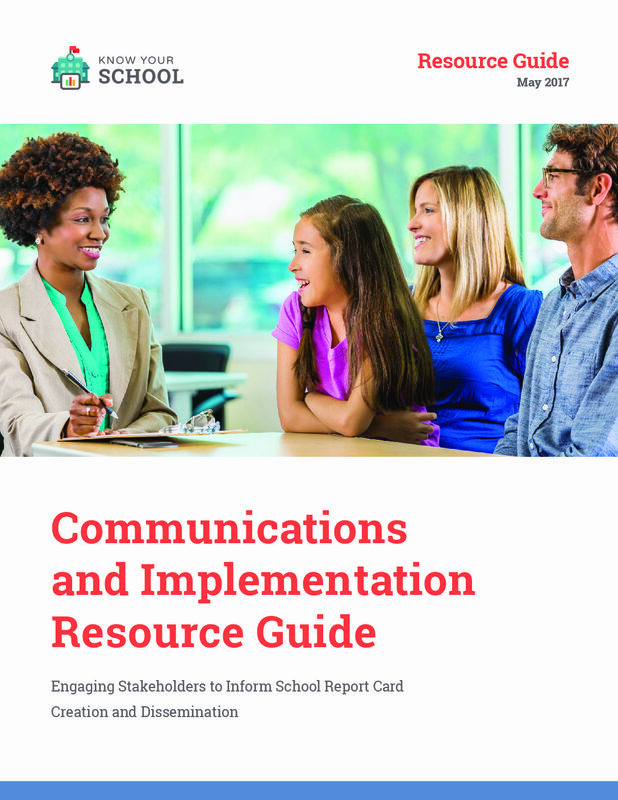 Communications and Implementation Resource Guide informs school report card creation, dissemination and stakeholder engagement. 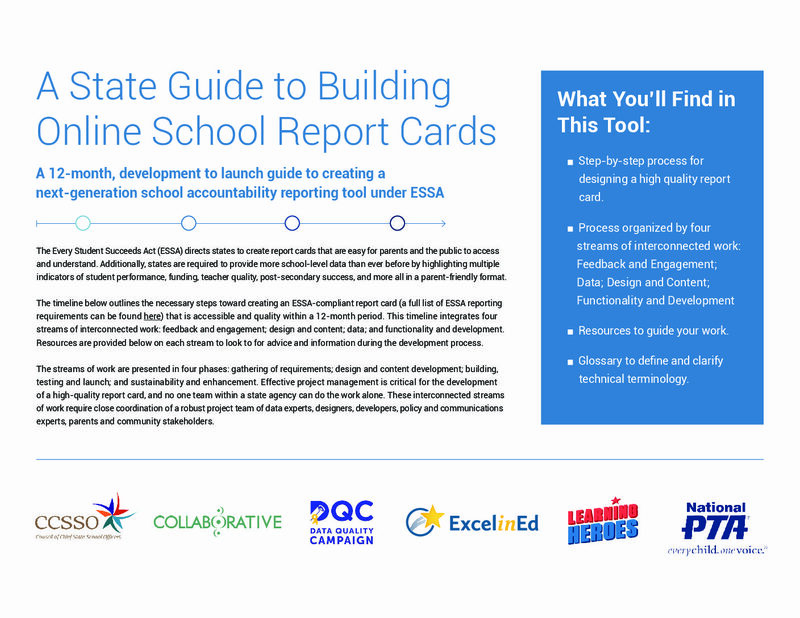 State Guide to Building Online School Report Cards is a 12-month, development-to-launch guide for creating a next-generation school accountability reporting tool. 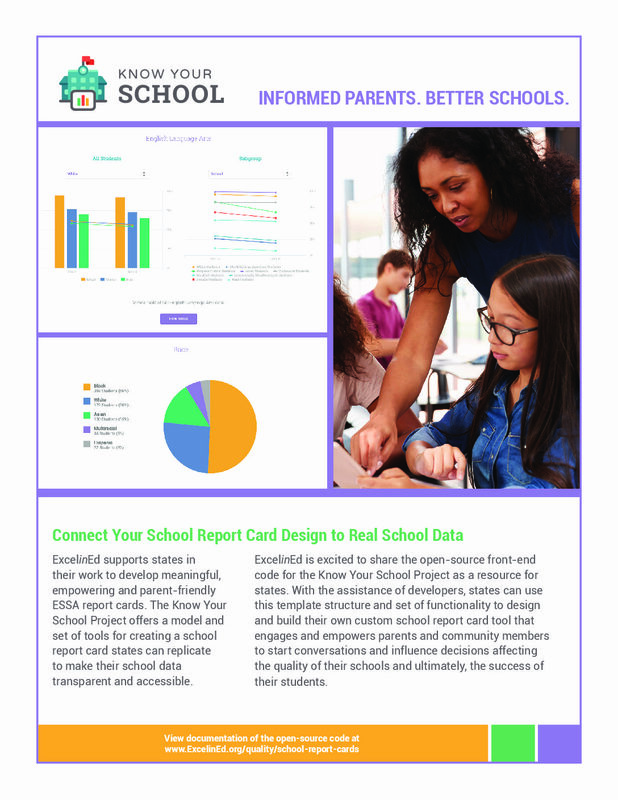 The Know Your School online report card tool is a prototype of a reimagined, transparent, online school report card for states. It is intentionally designed as a base for a state, with the capability of expansion over time. The Know Your School tool was built using open-source front-end code that is accessible free of charge as a resource for other developers. Implementation of the code will require modification for new data sources. This code is available for free as a resource for developers working to help other states advance their efforts to build online school report card tools. View GitHub repository with open-source code. #AskExcelinEd: All About the School Accountability Audience: Who uses accountability data? Why? How? #EIE18 Registration Closes in 7 Days!